One shot was what it took for Chicago to defeat fourth-ranked Emory (15–3, 4–3 UAA). One shot was what it took for fourth-year guard Matt Johnson to reach 49 points and break the UAA record for most points scored in a single game. With six seconds remaining in Friday’s game and the Maroons (11–7, 4–3 UAA) down 102–100 at the Ratner Athletics Center, Johnson caught a pass from fourth-year forward Tom Williams. To get to the basket, Johnson would need to drive the length of the court. Even with two Emory players, guard Michael Florin and forward Michael Friedberg, smothering him, Johnson ran past half court and launched a three-pointer from 30 feet away from the basket. The buzzer sounded and the ball hit nothing but net. Just like that, the Maroons won 103–102. The victory came before Sunday’s 96–92 win against Rochester (11–7, 2–5). 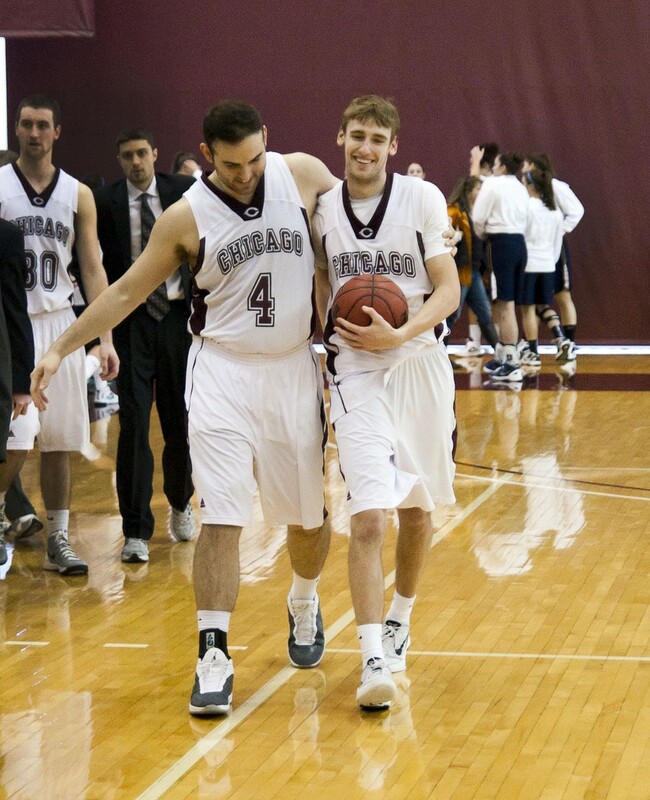 With the weekend sweep, the Maroons ended their four-game homestand in fourth place in the UAA. Before the shot, Chicago had contained Emory, forcing Eagles’ point guard Austin Claunch into early foul trouble. Only eight minutes into the game, Claunch was already assessed with two fouls, leading to only eight minutes of playing time in the half. With Claunch’s quickness temporarily removed from the contest, the Maroons pursued a more aggressive half-court defense. “We limited them in the open court,” head coach Mike McGrath said. Johnson’s offensive explosion allowed the Maroons to take leads and close gaps in the first half. Despite missing three free throws, Johnson shot 61.5 percent from the field and 50 percent from behind the arc during that time. The percentages amounted to 20 points on 13 attempts. With a 46–45 deficit heading into halftime, and 17 lead changes already on the night, Chicago continued to rely on Johnson’s shooting abilities. The Maroons’ strategy started to work early in the second half. In the opening seven minutes out of the locker room, Johnson had 10 points, giving his team a nine-point lead at 69–60. Chicago would hold the lead for the next 10 minutes. With 2:45 left in the game and a technical foul called on Emory head coach Jason Zimmerman, it seemed as if the Maroons would clinch the upset, given the 95–89 lead, and the flagrant foul called on Emory guard Justin Resnick 10 seconds later. Unfortunately for the Maroons, second-year guard Sam Gage missed both of his free throws. Chicago’s lead was cut to 96–92 shortly afterward when Emory guard Alex Greven sunk a three-point shot. Chicago turnovers, and Emory’s three-pointers and free throws gave the Eagles a 101–97 advantage with only 27 seconds left. With seven seconds until the final buzzer and the Maroons still down by the same score, Johnson shot a desperation three-pointer, which was blocked. A foul was called on Emory forward Jake Davis, however, sending the Chicago guard to the line for three shots. If Johnson made those shots, the Maroons would be within one point of Emory, and Johnson would have 46 points on the night, breaking Derek Reich’s scoring record from the 2002–2003 season for most points in a single game by a Maroon. By sinking his first two and bringing his scoring total to 45, Johnson broke the record. But that was the last thing on his mind. Johnson made his third free throw, and after the Maroons called a timeout, second-year forward Charlie Hughes fouled Greven to send him to the charity stripe for the double bonus. Greven missed his first attempt, and made his second, before Johnson’s game-winning shot. Even though the Maroons had their game against Rochester scheduled for Sunday, McGrath wanted the team to celebrate for the night. The Maroons were able to celebrate the monumental victory in incredible fashion. About one hour after the game ended, it was announced that Johnson’s shot would be featured on SportsCenter. Shortly before 2 a.m. on Saturday morning, the announcement became a reality. Not only did Johnson make the “Top 10 Plays,” he garnered third on the list. But, for the Maroons to keep their chances of winning the UAA, they would need to win Sunday’s game against Rochester, as well. McGrath said last week that three conference losses would probably determine the UAA winner. The Maroons already had three. Just like Friday, Sunday’s game proved to be another Matt Johnson spectacle. But once again, the Maroons’ defense was also crucial in the victory. Rochester preseason All-American point guard John DiBartolomeo was held to a slim 6–15 shooting from the field. “I thought we did a really good job of keeping him a little bit uncomfortable,” McGrath said. Meanwhile, Johnson shot 9–14 from the field and a perfect 15–15 from the free throw line. He also scored the 1,000th point of his career. McGrath has one explanation for Johnson’s unfathomable shooting performances as of late. “He’s just playing the game mentally a step ahead of everybody else,” McGrath said. The Maroons tip-off their UAA games on the road. This time, Chicago faces Emory on Friday at 7 p.m. and Rochester on Sunday at 11 a.m.